Crap is a highly dangerous substance that if eaten will turn you into a pig turd. Crap is what Mo does when he talks to women. Crap comes from the meaning 'Crank Dat Soulja Boy', which is Spanish for 'giant piece of turd'. If you are sick it will be good to eat your own Crap because it helps your body gain the poop you lost. Another source of daily Crap is Uncyclopedia. The large amount of Crap put onto this site by its users can help keep your Crap levels healthy. Spending too much time on the site leads to an overexposure of Crap, however. Side effects of overexposure to crap include: drooling, over-excessive n00bishness, overuse of the words "lol", "omg", and "pwn", lack of social life, and inability to get a girlfriend. Thus, doctors recommend that only 1-2 hours are spent on the site each day. CRAP receives much of its funding from concerned citizens that long for the day when walking into a public restroom doesn't require a full-body chemical protectant suit, gas mask and reserve oxygen source to be tolerable. Their first task was to characterize and classify the different levels of filth for public restrooms. 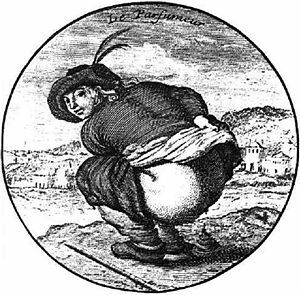 The classification system is referred to as the PUKES scale (People Underestimating the Killing Effects of Stench), which seeks to prepare the unsuspecting public for the hazards of the rest rooms they are about to enter. The classifications of the PUKES scale range from 1 (minor stains and stench) to 4 (dear GOD, please KILL ME NOW). The rankings are updated every year by the CRAP management committee to ensure that they stay current. Also poop consumption can give people diseases like rapeitites, face fungus, of the dreaded Taylor disease. This page was last edited on 29 March 2013, at 20:16.